Arizona Mama: Planes: Fire & Resuce in Theaters TODAY!! Planes: Fire & Resuce in Theaters TODAY!! 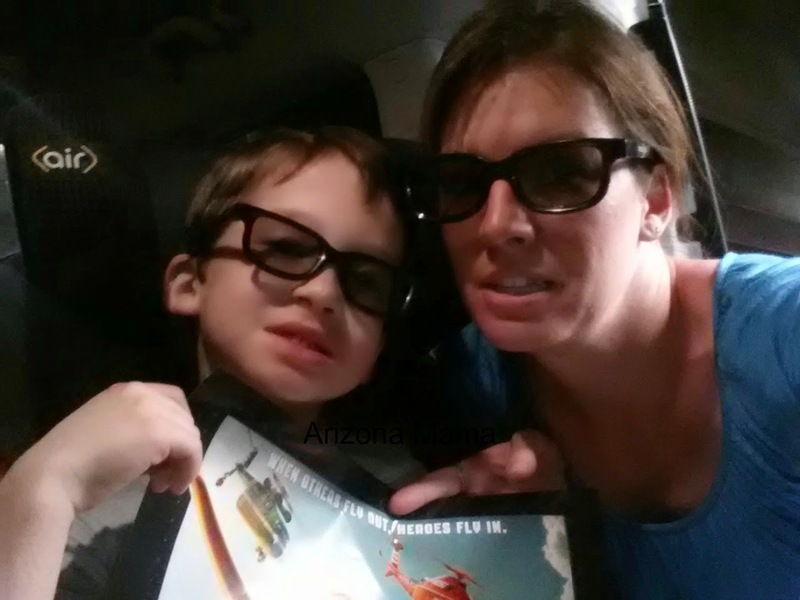 Jayden and I were recently invited to a 3D screening of Disney's newest movie Planes: Fire & Rescue. This movie is the excited sequel to the Disney Planes. We were both excited to see what happens to Dusty in this show. And it was great to have a date night with my oldest boy. Planes: Fire & Rescue” is a new adventure-comedy about second chances, featuring a dynamic crew of elite firefighting aircraft devoted to protecting historic Piston Peak National Park from raging wildfire. When world-famous air racer Dusty (voice of Dane Cook) learns that his engine is damaged and he may never race again, he must shift gears and is launched into the world of aerial firefighting. Dusty joins forces with veteran fire-and-rescue helicopter Blade Ranger (voice of Ed Harris) and his courageous team, including spirited air tanker Dipper (voice of Julie Bowen), heavy-lift helicopter Windlifter (voice of Wes Studi), ex-military transport Cabbie (voice of Captain Dale Dye) and a lively bunch of brave all-terrain vehicles known as The Smokejumpers. Together, the fearless team battles a massive wildfire and Dusty learns what it takes to become a true hero. Directed by Bobs Gannaway (“Secret of the Wings”) and produced by Ferrell Barron (“The Fox and the Hound 2”). This movie is great! If you or your child likes Planes or Cars this is a must see. There was constant action and excitement. Both Jayden and I were really into what would happen next. Dusty Crophopper begins to have some mechanical problems that limit his ability to race anymore. After an accident at the airport in Dusty's home town he makes a shift to become a part of the fire and rescue team. So he has to train with an elite firefighting crew in Piston Peak National Park. There is action, comedy, and a little romance (sort of). And with the movie being 3D the planes come flying out at you. It really puts you in the action. There are many great references that keep adults entertained too. Kids will be happy to see some of their favorite characters from the first Planes movie and meet some great new characters. When the movie ended Jayden immediately looked at me and said, "I love that movie. My favorite part is when the girl plane said I like to watch you when you sleep to Dusty." It was funny because that was a part that made me laugh too. Although seeing the first Planes movie does give you reference as to who Dusty is and where he came from, it is not completely necessary to see it before this one. You can follow along in the movie even if you didn't see the first one. This is a movie I would love to take or grandkids to. It would be so cool to have the planes flying at you. I was looking at this movie as it is playing at the drive in. Looks like a great movie. Awww I want to take my 3 year old daughter to see this. She would love all the firetrucks and dump trucks. My kids have been asking to see this for a while now & they are so happy it's finally out. We are going this week. This looks like a really good movie. I saw a preview for it at the theater, and some of the scenes were hilarious. that movie looks so dang cute! Me and my kids can't wait to check it out! I've heard great reviews about this movie. I think my husband is going to take our son sometime this summer. It looks really cute! This looks like such a good movie....Davey asked when are we going? Maybe tomorrow! I wasn't sure I was going to enjoy Planes, but it is one of my favorites now. So, I can't wait to go see this one it looks awesome! This looks like such a fun time. 3D movies are always a hit with big kids aka adults and little kids. I can't wait to take my kids to this. They love the characters and the fun and I love the jokes that only adults get. What an adorable movie to take kids to. I will have to make sure that my relatives and friends that have little ones make sure they know about this one. This is going to be a cute movie. My nephew definitely wants to go see it. I'm gonna be taking the kiddos to see this one. They can't wait to see it. This movie was so good. It was definitely one I think my kids will enjoy for years. I'm really looking forward to taking my grandsons to go see this movie! They are going to love it!